"We will do everything up until the 30th for the Greeks to show they are prepared to reform," Oettinger, the EU commissioner for digital economy and society, told Deutschlandfunk radio. "A 'Grexit' isn’t our aim but would be unavoidable if there is no solution in the next five days," he said. The comments come as a June 30 deadline for Greece to repay about €1.6 billion of its debt to the IMF is nearing. On June 5 the Athens delayed its €300 million payment on promises they would settle the entire sum due in June at the end of the month. The new Greek government is engaged in tough negotiations with foreign creditors on the restructuring of the country’s debt. It came to power on a promise to stop the painful austerity policies of its predecessors, advocated by the creditors and which resulted in social and economic problems in Greece. But Athens is short of the money and is unable to pay the national debt, which makes exiting the Eurozone and defaulting a possible scenario. Over the past few days, Greek Prime Minister Alexis Tsipras has been negotiating with the IMF and European officials on proposed reforms that his government is required to initiate, to secure a 7.2-billion-euro tranche of bailout money. So far the so-called troika of creditors – the ECB, the IMF and the European Commission – has rejected Greece’s reform plans saying that they either lacked concrete proposals or didn’t provide for enough savings. On Wednesday, Tsipras complained on his official Twitter account that the international creditors have never before been so persistent in rejecting reforms plans in other struggling EU members, neither in Portugal nor in Ireland. Such a stance could mean the creditors were not interested in reaching a deal or pursued some special interests, he added. 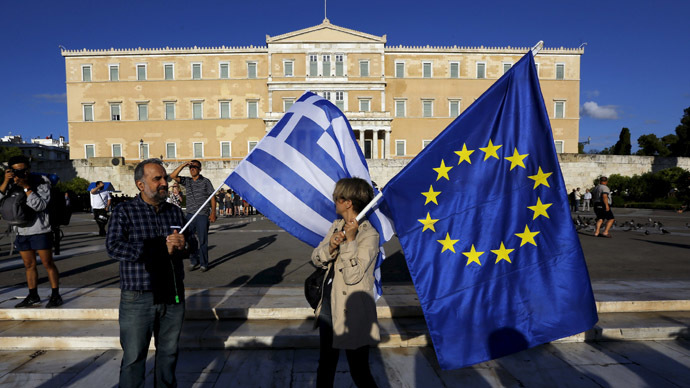 Greece and its lenders have been gridlocked in talks over its €240-billion debt for about six months. Fears of Greece defaulting are causing a run on the banks, with people withdrawing record amounts of deposits.